Tens of thousands of mourners have gathered in the Philippines' capital Manila for the funeral of former President Corazon Aquino. After a mass in Manila Cathedral, her body was carried through the city to be buried next to her husband, Benigno Aquino, who was assassinated in 1983. 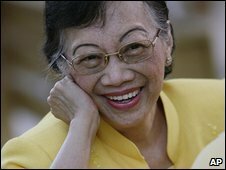 Mrs Aquino died on Saturday of colon cancer at the age of 76. She became president in 1986 after leading the "people power" uprising that overthrew Ferdinand Marcos. More than 1,000 government officials, diplomats, priests, nuns and visiting dignitaries gathered in the cathedral for her funeral Mass. President Gloria Arroyo arrived straight from the airport after a visit to the US but left before the ceremonies and procession. The two had been at odds after Mrs Aquino called on Mrs Arroyo to resign over allegations of vote-rigging. Mrs Aquino's successors Fidel Ramos and Joseph Estrada, and East Timor's President Jose Ramos-Horta, also attended the Mass. Mr Marcos' two children paid their respects to Mrs Aquino on Tuesday as her body lay in state at the cathedral. Outside, thousands of people - many wearing yellow, the colour associated with Mrs Aquino's people power movement - stood in heavy rain watching the proceedings on giant screens. 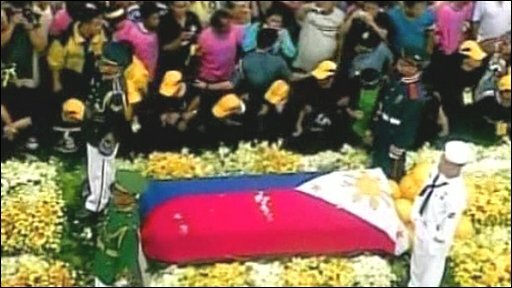 Tens of thousands more people lined the streets of Manila and walked behind the vehicle carrying her flag-draped coffin on its way to be buried next to her husband in a private ceremony at Memorial Park. 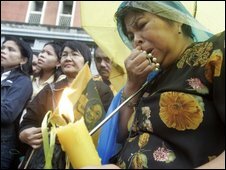 The Philippines has announced a 10-day mourning period and declared Wednesday a public holiday. Mrs Aquino was catapulted into politics following the murder of her husband, the prominent Senator Benigno "Ninoy" Aquino, who had been preparing to run for president. After winning the presidential elections in 1986, she went on to run a country deeply divided after years of martial law and communist insurgency. She battled several coup attempts against her rule, protected the country's fledgling democracy and freed political prisoners. In recent years, she campaigned against former President Estrada, but then reconciled with him to join protests against President Arroyo over allegations of vote-rigging and corruption.